Client : Kurk Construction,Tourism and Trade Ltd. 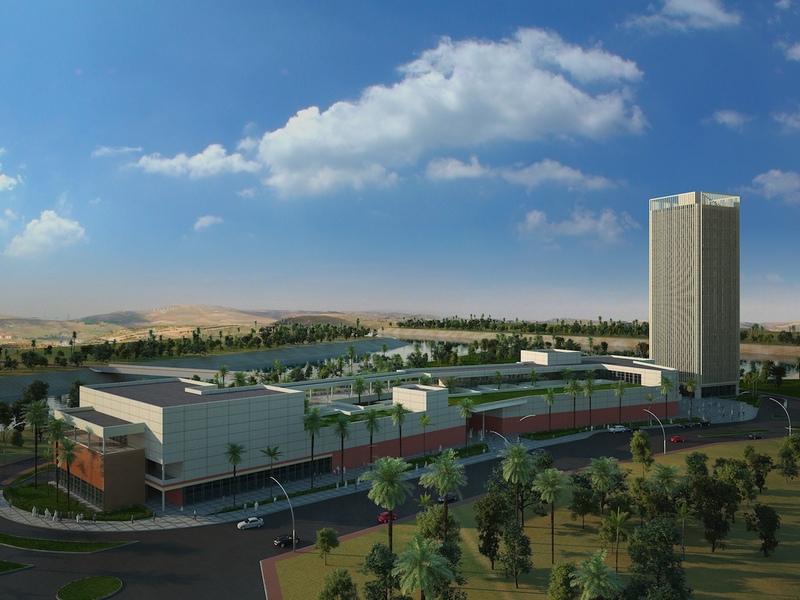 The Maysan Mall and Office Project is conceived as a building complex, comprising of a partially three storey elongated open mall, a 19 storey office tower and a civic plaza (Maysan Mall Plaza) connecting the two buildings, planned along the North-South axis, on the narow parcel adjoining the Dijlah Street. There are 3 entrances the Mall; one from the Maysan Mall Plaza and two from the Dijlah Street and from the west side of the building, respectively. The west entrance also connects to the pedestrian walkway of the future development, planned on the west side of the parcel. 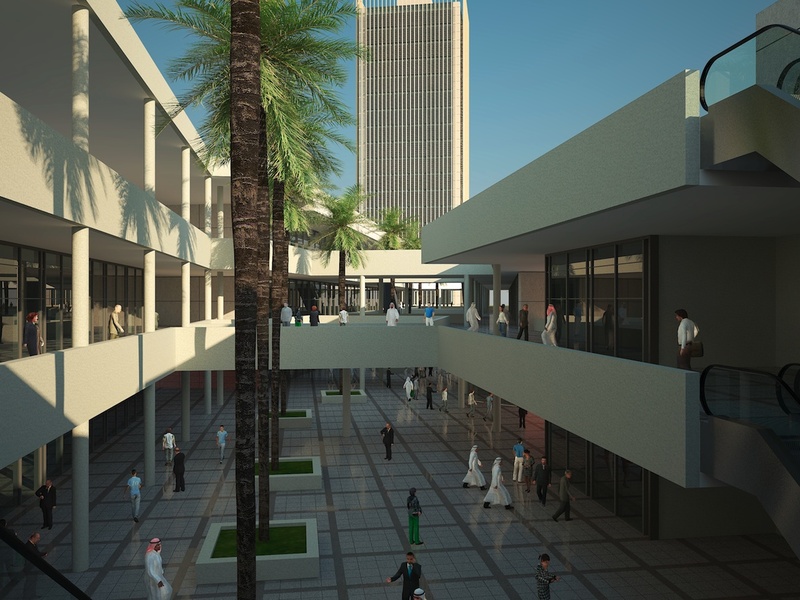 Due to the climatic conditions of the region, a semi-closed mall has been envisaged, planned along a linear shopping arcade, terminated with a semi-covered bazaar on the southern end of the building. The bazaar concept in shopping malls is currently becoming a very popular design idea, where the ambiance of traditional shops selling vegetables, fruits, nuts, spices, coffee and tea, as well as fresh meat and fish, etc. is re-created. Here you can buy fresh food and in the case of butchers and fish stores, for example, you can even have the food you have just purchased, cooked and served outside the shops, within the Mall. Here, there will be also traditional and modern coffee and tea houses. 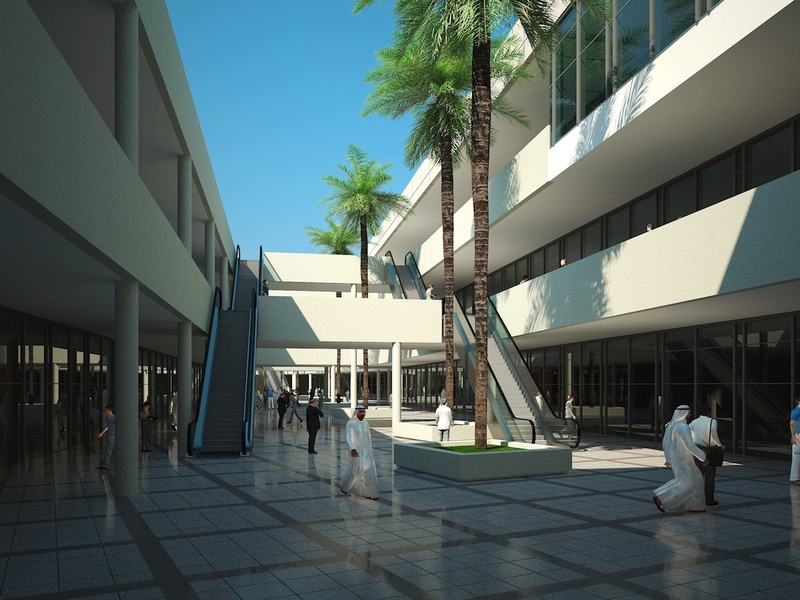 In the Maysan Mall, there will be varying sizes of rentable space, depending upon the local needs, whose sizes can easily be altered during the design development phase. These shops have been planned on the ground and first floors. On the second floor, there will be no shops. Instead, there will be small fast food counters, serving both the closed, air-conditioned interiors and also semi open terraces (known as “The Food Court”) and a specialty restaurant. On this floor there will also be a Cinema Court, with three cinema theaters having 140, 99 and 72 seats respectively. Both the restaurant and the Food Court overlook the river and the future development area to the west of the site. In the future development area, it is planned to have a residence tower and a hotel tower. The basement of the site is planned as covered garage with mechanical areas, storage and services taking place as well. The parking area has a capacity 302 vehicles and is reached via a ramp from the Dijlah Street. The terrace of the Mall is to be green-landscaped roof, thus creating a cool, insulated surface, absorbing the sun’s radiation, as well as being a pleasant surface to look at. The Office Tower is a 19 storey building. 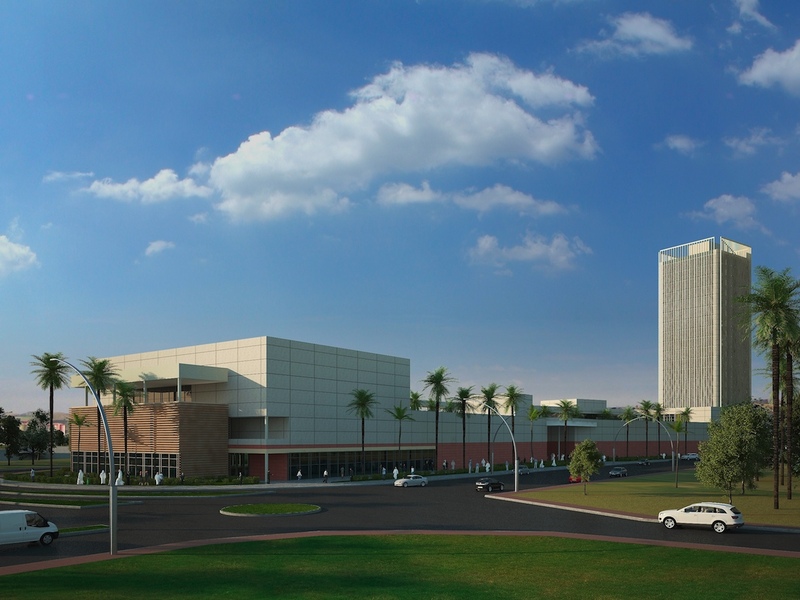 Due to the harsh climatic conditions in the south of Iraq, the building facades are protected by a double-skin sunscreening system, which prevents the sun from directly entering the building, thus keeping inside cooler with less energy consumption. On the north side of the building, there are four 2-storey atriums, which have been conceived as social spaces, acting also as relaxation lounges with trees and greenery, creating a micro-climate within the building. There will be no wet spaces within the core but rather within the rentable spaces. 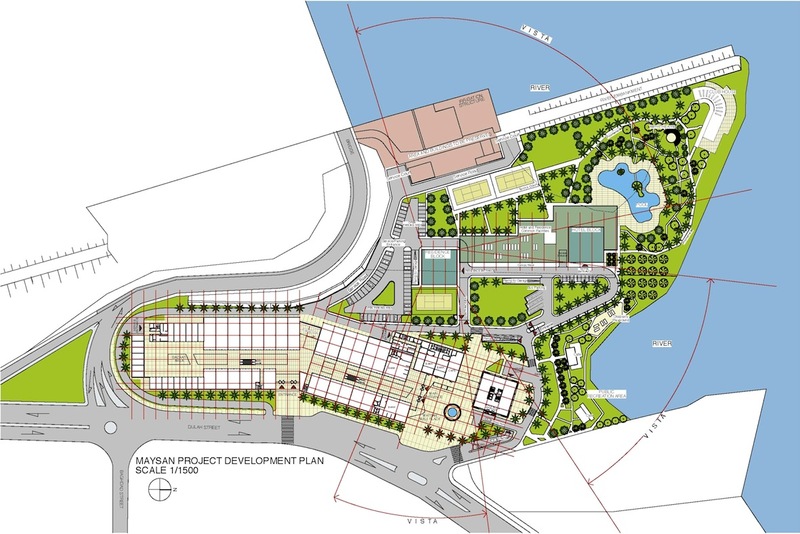 The Maysan Mall Plaza is proposed to be a social/civic gathering space for the inhabitants of the town, where all sorts of activities can take place. It connects the Dijlah Street to the Mall, the Office Tower and also the future development area on the west. Service to the site will take place by means of service traffic loop, encircling the site.